Products & Solutions | RTC Group, Inc.
RTC's StoreMobile INV is a tool designed to allow JDA® MMS™ users to utilize the benefits and functionality of mobile handheld technology. Do you find yourself struggling with inefficiencies in your current JDA® Merchandise Management System® (MMS®) warehouse processes that are driving you nuts? RTC's Loss Prevention Analyzer (LPA) provides an easy-to-use, browser based tool to help monitor and eliminate cashier theft through the use of "exception transactions". RTC's Advanced Promotion Management (APM) module provides retailers running JDA® MMS™ with an automated promotion promotion system that eliminates excessive discounting. ARM significantly increase the accuracy of the MMS replenishment formula while substantially decreasing the manual effort to manage replenishment. RTC's Dashboard Management Module (DMM) helps improve the performance and management of JDA® MMS™ software by monitoring critical systems and business indicators. RTC's PLAN-O-GUIDE Management Module for JDA's® MMS™ software takes your plan-o-grams to a new level of efficiency, profitability, and simplicity. 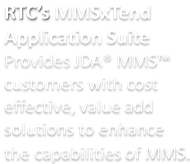 RTC's commitment to support and improve JDA's® MMS-i™ has once again lead to another fantastic module. In the past, managers working with several similar SKUs with corresponding item attributes were left with limited search results. Designed to ensure optimal operation and systems processes.